Gibson Brands, Inc. has teamed with Bob Dylan to release two new SJ-200 Guitars, including a Bob Dylan SJ-200 Collectors Edition and the Bob Dylan SJ-200 Player’s Edition. 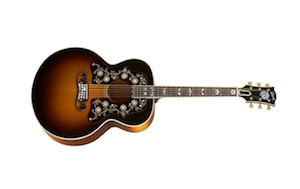 The SJ-200 Player’s Edition is a high-performance model based on Bob Dylan’s personal guitar. This model is constructed with Adirondack red spruce and hand-selected AAA flamed maple. The headstock features the artist’s eye logo with a Bella Voce mother-of-pearl inlay on the fret board. Double pick guards feature an engraved design, with mother-of-pearl dot inlay. This vintage-style model comes equipped with an LR Baggs™ Anthem pickup. Instrument, music and sound company Gibson Brands is based in Nashville, Tenn.